Since 2000 Lila has been helping clients to meet and exceed their nutrition, health and fitness goals, and will guide you through the goal setting process with ease. Together we find ways to turn a vision for a healthier you, into a reality. 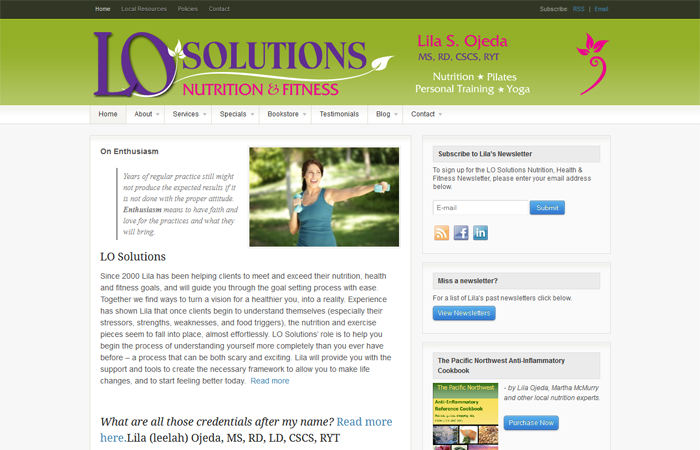 Experience has shown Lila that once clients begin to understand themselves (especially their stressors, strengths, weaknesses, and food triggers), the nutrition and exercise pieces seem to fall into place, almost effortlessly. LO Solutions’ role is to help you begin the process of understanding yourself more completely than you ever have before – a process that can be both scary and exciting. Lila will provide you with the support and tools to create the necessary framework to allow you to make life changes, and to start feeling better today.